Hear from our fellow F&B partners who went against all odds to chase their dreams. We understand working in the F&B industry is not easy. Despite it being stressful, you have persevered through challenging times holding on to your goals. Be inspired by these 3 passionate chefs and owners, and how they went against all odds to chase their dreams. Take up the Fusion Gourmet Challenge! Think you have what it takes to turn an ordinary dish into something extraordinary for your diners? Take up the Fusion Gourmet Challenge and whip up a creative fusion dish for a chance to win up to $1,000 shopping vouchers and media publicity for your business! With Knorr Concentrated Chicken Bouillon, you can deliver consistent, umami and delicious flavour in a more efficient way. Read on to see what these chefs have to say about this ingredient. 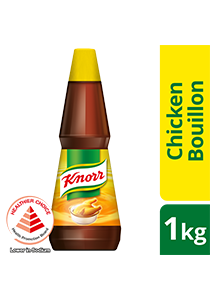 Try the Knorr Concentrated Chicken Bouillon now! Switch from regular seasoning to our bouillon and see how it can elevate your dishes to another level to wow your diners. Request for a sample now. Download our collection of Heritage Halal Recipes for inspiration. Looking for some ideas to get you started? Take a look at these recipes and start creating your own unique fusion halal dishes.